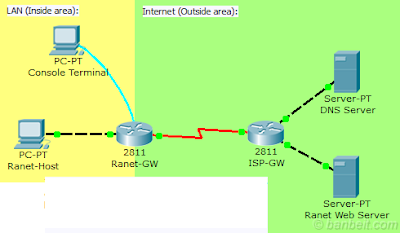 You are the network administrator at Ranet, and have to config the Ranet-GW router via Console Terminal to let hosts in our LAN that have IP address: 192.168.0.193 - 192.168.0.206 can connect to the internet. Your ISP has given global IP for 6 IP as 25.5.5.65 - 25.5.5.70. 1. Use ACL no.1 for Local IP list. 2. Use pool name “Ranet” for Global IP list.